Amid weak automobile market to boost its sales and maintain supremacy in the 2-wheeler automobile market in India, HeroMotoCorp has introduced a new scheme to its customers. 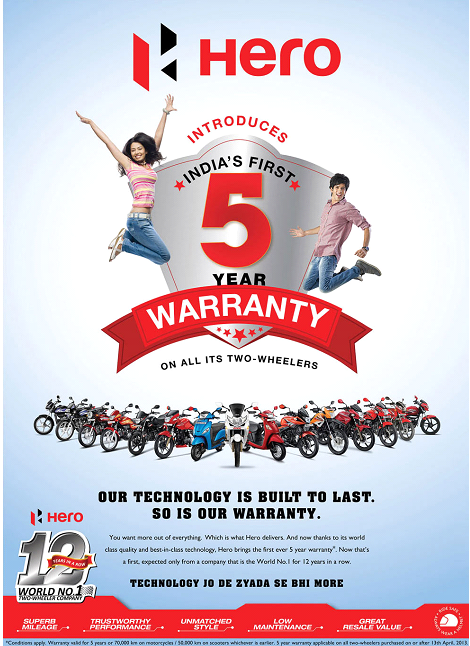 Hero now offers 5 year warranty on all its 2-wheelers including scooters. 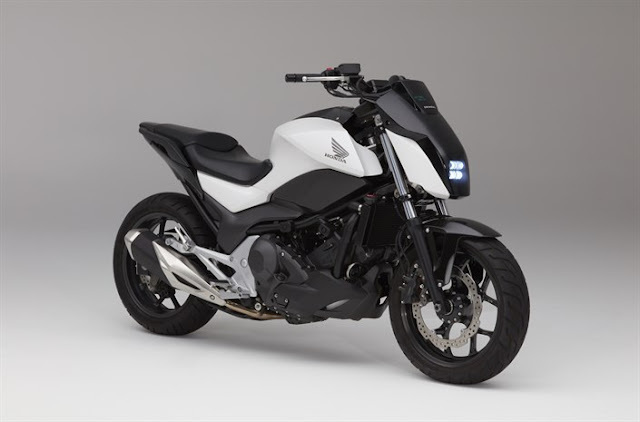 Fearing tough competition from its two biggest rivals Bajaj Auto and Honda Motorcycle and Scooter India (HMSI), Hero has put up this marketing gimmick to maintain its position as the No.1 motorcycle manufacturer in India. Hero bikes are highly popular for their value for money and fuel efficiency. But remember the heart of all the Hero motorcycles which earned the company as the world's largest motorcycle manufacturer were the ultra-reliable and frugal Honda engines. The joint venture between Hero Group of India with Honda (HeroHonda) broke in December 2010. Although Hero will continue to receive technology from Honda till 2014. That means that all the successful models of Hero will continue to be as good as they were till 2014. After that Hero will develop its own engine and these models will be powered by the in-house engine from Hero. The big question is will the Hero developed engines match the time proven, reliable and frugal Honda engines? This will be the real test of HeroMotoCorp and the future of India's largest motorcycle manufacture lay in their own hands. 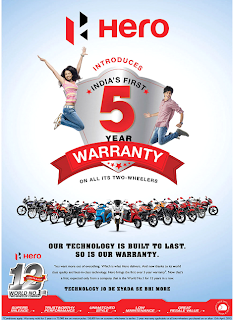 Although the new 5-year warranty from Hero looks tempting, it has conditions applied!! Let us scan this deal a little deeper. The good thing about this scheme is that it is applicable to all its 2-wheeler offering i.e. both geared-motorcycles and scooters. This means that if you motorcycle completes 70,000 kms after 3 or 4 years, the 5 years warranty becomes void and is no more applicable. Similarly for scooters if you complete 50,000kms after 3 years or 4 years, the 5 years warranty becomes void and is no more applicable. Although the scheme looks so much appealing at first, it is just a marketing gimmick and actually the customer is being taken for a ride. Lets see why this scheme does not give any special benefit. Lets consider a practical example. Suppose your daily commuting on motorcycle/scooter is 50 kms, this means that per month you ride your motorcycle/scooter for around 1,500 kms. So, in a complete year your motorcycle/scooter clocks 18,000 kms. So if you buy a motorcycle, at 18,00 kms/year, you will complete 70,000 kms even before you complete 4 years. And if you buy a scooter, at 18,000 kms/year, you will complete 50,000 kms even before you complete 3 years. Hence always read the Conditions Apply section of any bombastic scheme carefully!!! Saint Honda Bikes, has been doing business for a long time in India, and has made and sold a great many bicycles. They have a notoriety taking into account the nature of their items, and their persistent responsibility to incredibleness. Hero Hunk is a 150 cc motorcycle launched by Hero Honda in 2007. In 2011, Hero MotoCorp gave the Hunk a facelift, offering it with the option of a rear disc brake.